Avid has released Pro Tools 2018.7 with new features like being able to search to find that plug-in in a menu list, making multiple selections in a menu, maintain the relative grid position moving clips around and 9 pin track arming improvements for Pro Tools Ultimate users. We have all the low down on the next phase of Pro Tools development designed to help us be creative and not bogged down in technology. Ever found yourself hunting through lists of plug-ins hunting for a plug-in you know you have but you can't find it? Now with Pro Tools 2018.7 you no longer need to scroll through lengthy menus to find the plug-in or bus you need. I would love to be able to insert a plug-in and just type "h" and H-Delay by Waves appears in the search result alongside other plug-ins beginning with H. This feature would save me from having to use my eyes to read through what is currently a lengthy list of plug-ins. Well, Dan, the Avid Development team has integrated tag-like search capabilities into the Inserts, Sends, Inputs, and Outputs menus as well as the plug-in menus. Now you can simply start typing and Pro Tools will display all matching items, enabling you to find and assign VIs, effects, and busses so much more quickly. With Pro Tools 2018.7 you can now select multiple items in a menu in one go. Use the key command Control+Click on a Mac or Start+Click on a Windows Pro Tools computer on a Track Insert, Send, or I/O Window and you can now select as many items as you want from the contextual menu. When rearranging a session, would you prefer that everything didn't perfectly align with the beat? Now in Pro Tools 2018.7, you can now have Pro Tools keep the relative grid position when copying, cutting, and pasting audio and MIDI clips and note selections. This now preserves the perfectly imperfect feel of unquantised music by keeping all correct offsets established in your timeline. This feature is designed to keep the human feel and save time as you re-arrange your song. With Relative Grid mode enabled, Pro Tools maintains any Relative Grid offset from the nearest grid line for audio clip selections and MIDI notes when pasting cut or copied audio or MIDI data. Relative Grid mode must be enabled when pasting. Select and Cut or Copy audio that has a Relative Grid offset. Place the Edit insertion at the grid location where you want to paste the audio. The audio is pasted at the grid location, but with the same Relative Grid offset as the cut or copied audio. In Notes view, select and Cut or Copy MIDI that has a Relative Grid offset. Place the Edit insertion at the grid location where you want to paste the cut or copied MIDI notes. Choose Edit > Paste. The MIDI notes are pasted at the grid location, but with the same Relative Grid offset as the cut or copied MIDI notes. Place the Edit insertion at the grid location where you want to merge the cut or copied MIDI notes. Choose Edit > Paste Special > Merge. The MIDI notes are merged with any existing MIDI at the grid location, but with the same Relative Grid offset as the cut or copied MIDI notes. In this next video, Avid Application Specialist, Greg Chin looks at improvements to the relative grid workflow. With Pro Tools 2018.7 you can now maintain the perfectly imperfect feel of your performance when copying, cutting, and pasting audio and MIDI clips and note selections in Relative Grid mode. For those mixing large-scale audio post or Dolby Atmos productions on a console that uses the Sony P2 9-pin protocol over a 9-pin MachineControl Deck Emulation connection. With Pro Tools Ultimate 2018.7 you can now remotely arm, change Input Monitoring, mute, and solo up to 112 tracks (up from 64 tracks) to handle the bigger and more complex sessions you get with immersive formats like Dolby Atmos. There is no need to find workarounds or abandon your trusted old analog console. Avid has added a number of keyboard shortcuts to Pro Tools 2018.7 and to help to show how they fit into workflows as well as adding certain commands that were only available as shortcuts to the Edit menu. Move Edit Left - Moves the entire current Edit selection to the left by the duration of the selection. In Commands Keyboard focus, press L.
Move Edit Right - Moves the entire current Edit selection to the right by the duration of the selection. Halve Selection - Maintains the current Edit selection start time but reduced its duration by half. Double Selection - Maintains the current Edit selection start time and doubles its duration. Duplicate and Extend Selection - Pro Tools now lets you duplicate the Edit selection (including all track data in the selection), keep the selection start, and extend the selection to the end of the duplicate. This facilitates working with audio loops and repeating MIDI content. Choose Edit > Selection > Duplicate And Extend Selection. Press Command+Option+Control+Shift+D (Mac) or Control+Alt+Start+Shift+D (Windows). Move Edit Up - Moves the Edit selection up one track. If more than one track is included in the current Edit selection, those tracks are removed from the selection and the selection is only on the one track. Move Edit Down - Moves the Edit selection down one track. If more than one track is included in the current Edit selection, those tracks are removed from the selection and the selection is only on the one track. Extend Edit Up - Extends the Edit selection up one track. Extend Edit Down - Extends the Edit selection down one track. Remove Edit from Top - Removes the top track from the Edit selection. Remove Edit from Bottom - Removes the bottom track from the Edit selection. Press Shift+Page Down (full-sized keyboard). Press Shift+Page Up (full-sized keyboard). Key modifiers can be used to target the same playlist in all tracks of the same type or in all selected tracks of the same type (audio, MIDI, Instrument, or Video). In Playlists view, Option-click the Target button for the playlist you want to target. Hold down Option (Mac) or Alt (Windows), and click on the Playlist Selector menu, then click the Target Playlist sub-menu and click on the playlist you want to target. Hold down Option-Shift (Mac) or Alt-Shift (Windows), click on the Playlist Selector menu, then click the Target Playlist sub-menu and click on the playlist you want to target. Enabling or Disabling the Target Playlist is an undoable action that appears in the Undo History. The Edit Window Scrolling mode updates without interrupting the Transport. Retrospective Record for MIDI captures your performance regardless of the recording mode. When applying Retrospective Record for MIDI, MIDI performances are placed at the exact Timeline location of the performance on the appropriate MIDI or Instrument track even when punch recording. In lower versions of Pro Tools, there were issues with Retrospective Record and punch recording. During playback, if the Default Thru Instrument is set to Follows First Selected MIDI Track (Setup > Preferences > MIDI), matching MIDI data is buffered for the first selected MIDI track. Likewise, matching MIDI data is buffered for each record-enabled MIDI (or Instrument) track. So, when applying Retrospective MIDI Record, MIDI data is recalled from each track buffer on a track-by-track basis. This lets you use hardware monitoring with any output channels on your audio interface without having to re-configure your session. Previously when Low Latency Monitoring was enabled, software monitoring was disabled only for tracks assigned to physical outputs 1 or 2 on your audio interface. Pro Tools 2018.7 now provides a 3-second peak indicator for visual indication of peak CPU usage in the System Usage window on the Elastic Audio processing, Clip Gain processing, and Native plug-in and mixer processing displays. Pro Tools lets you use a Master Fader to act as a Monitor Path control for EUCON control surfaces. Rotating the Monitor/Control Room knob raises and lowers the Master Fader level. Pressing the knob sets Master Fader level to –INF (effectively Muting or “Cutting” the monitor level). Press again to return to the previous level. Pro Tools 2018.7 has the same OS compatibility as 208.4 released back in April according to the latest version of the Pro Tools Operating System Compatibility Chart. There are no new versions of either the Mac or Windows operating systems. Avid is still saying in the Pro Tools 2018.7 Release Info that macOS High Sierra 10.13.4 and later is not recommended due to performance issues at lower buffer sizes. You can see in this table what features have been added to Pro Tools so far during 2018. As long as you have a current upgrade plan for Pro Tools or Pro Tools Ultimate. you should find Pro Tools 2018.7 in your Avid Master Account. If it is not there, then please be patient, as long as you have a current upgrade plan it will arrive very soon. 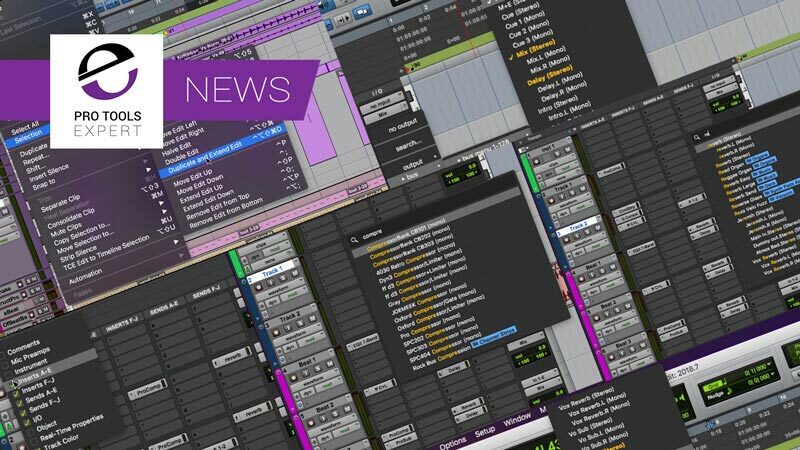 We are very excited to deliver this latest Pro Tools release, which introduces new features that speed up workflows and addresses top stability requests. We are also continually working on new features and enhancements to inspire our customers and address their needs. We understand the dedicated Pro Tools Development team are working as hard as they can to bring us new features and they are already working on the next release.